The Spiritual Can Illuminate The Scientific. The Scientific Can Illuminate The Spiritual. There has been (and will continue to be) debate about evolution and the age of planet Earth. Among Christians, especially the growing fundamentalist groups, creationism is often embraced, stating a literal 6 day creation of the Earth. Some Charedi Jews (i.e. ultra Orthodox) hold to the Earth being 5767 years old, though an important distinction should be noted: the “literal” reading—the idea that the text shouldn’t be interpreted as much as simply “read”—taught by many forms of fundamentalist Christianity, isn’t really possible within Judaism because we work with the original Hebrew of the Torah which, by definition, can only be interpreted into English, ancient Hebrew worldview converted into English thought and words. So even the more hardline factions that strictly hold to the 5700+ Hebrew calendar years timeframe for the Earth’s age (not meaning 5700+ years from Adam and the human spirit’s first run-publication, or something else) aren’t fundamentalist in the same way strict, sola scriptura literalists are, as they don’t insist that this is the only meaning within the passage. Within Judaism it’s taken for granted that multiple meanings and explanations, even hidden mystical interpretations, exist on every page, with numerous wisdom and commentary texts relied upon to “bring down” (from Sinai) right interpretations, not the “one book, one meaning” mentality associated with the sola scriptura-thinking prevalent in Protestant versions of Christianity. “18 His snorting throws out flashes of light; his eyes are like the rays of dawn. 19 Firebrands stream from his mouth; sparks of fire shoot out. 20 Smoke pours from his nostrils as from a boiling pot over a fire of reeds. It’s unmistakable that tananim are giant reptiles or members of a terrifying reptiloid species of some kind. In modern Hebrew, “tananim” are crocodiles. the sea monsters: The great fish in the sea, and in the words of the Aggadah (B.B. 74b), this refers to the Leviathan and its mate, for He created them male and female, and He slew the female and salted her away for the righteous in the future, for if they would propagate, the world could not exist because of them. הַתַּנִינִם is written. [I.e., the final “yud,” which denotes the plural, is missing, hence the implication that the Leviathan did not remain two, but that its number was reduced to one. ]- [from Gen. Rabbah 7:4, Midrash Chaseroth V’Yetheroth, Batei Midrashoth, vol 2, p. 225]. Okay, come on… c’mon, we’re talking about ancient giant reptiloids that emerged before birds and mankind, and have to go extinct before humanity can begin their world, being too mean, too enormous, too terrible, to co-exist with humans. The preponderance of the evidence indicates the tananim gedolim are dinosaurs. 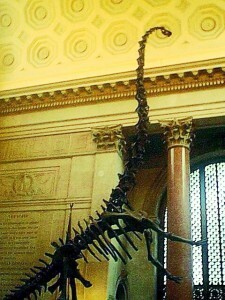 I love dinosaurs. They did exist. the Barosaurus was unbelievably tall when leaning back onto the hind legs to slap attackers. 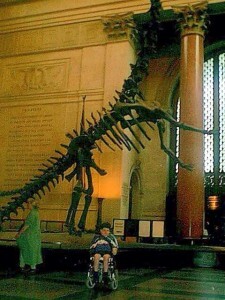 me with the Barosaurus skeleton in the Hall of Saurischian Dinosaurs, American Museum of Natural History, NYC. Early June, 1999. 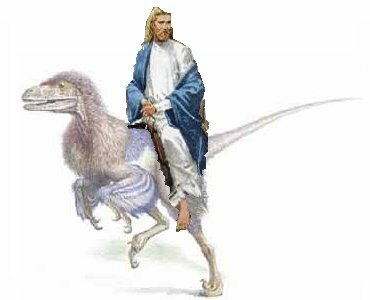 There are people who retcon history to erase the dinosaurs, or say dinosaurs coexisted with humans, or say that tananim gedolim being dinosaurs is Biblical proof that dino-human coexistence occurred. The Creation Museum in Kentucky has displays showing a vegetarian Tyrannosaurus in Eden, mankind (including human children) peacefully coexisting with predatory dinosaurs that somehow aren’t chasing and eating them, dinos saddled for riding… it’s crazy. and all Cretaceous fossils are 144-65 Million Years inaccurate is way too much for me to swallow. We’ve proven that situations like The Lost World or The Flintstones didn’t happen. In this actual exhibit at the Creation Museum (real, not photoshopped) a baby Tyrannosaurus eats plants in Eden, as a Jesus-looking figure (standing inside the T-Rex’s kill radius) looks on peacefully. The Tyrannosaurus‘ teeth, blades rather than the grinding molars characteristic of herbivorous dinos, may have made chewing leaves physically impossible. It stretches credulity past the breaking point to think the dinosaurs (meaning “terrible lizards”), including Tyrannosaurus Rex, each tooth a scimitar-looking kill-blade, chilled with early homo sapiens, just kicked back and watched Eden flag football together with mankind like bros, and didn’t make a midnight snack out of the human race and end it forever. Velociraptors would see humanity as a feast, raptor-christmas!!! Dr. Gerald Schroeder makes a convincing case that the six days are six epochs, and brings down several Tanakh passages that substantiate that idea. Dr. Gerald Schroeder is an Orthodox Jew and MIT-trained scientist who has made it his life’s work to teach that the Torah can offer enriching perspectives to verifiable science and visa versa. His lectures are the source of much of what I’m about to tell you. The Jewish sages of the Middle Ages tell us the Earth is billions of years old, and they weren’t bending to science, because science didn’t even exist in their era. Nachmanides described all matter of the universe expanding from the size of a seed (the big bang) in the 13th century… scientific truth mirroring spiritual truth. In Genesis, you see one beginning, not a cyclic universe. This has been shown by science, a big bang booting-up the universe and linear time. The second description of Creation describes Adam not finding a mate among the animals. “And man named all the cattle and the fowl of the heavens and all the beasts of the field, but for man, he did not find a helpmate opposite him.” (Gen. 2:20) Obviously, Adam in sinless Eden is not a sheep molester. The Midrash explains among the “beasts of the field” were animals who looked and talked just like people! Prehistoric man! And since he couldn’t find a soul mate among Neanderthals, Hashem created the male and female soul. 5767 years isn’t the age of the Earth, but the time since the human soul was bestowed. 5767 in history mirrors what has been discovered by archeology as about the time organized civilization arose. I don’t think this is a coincidence; this is obviously an important break in human history. Spiritual truth can mirror scientific truth. There are countless examples of this. Another was how a Talmudist, going on kabbalistic teachings, deduced a major descending artery in the brain that was later confirmed to exist by science. Both the scientific and the spiritual are very exciting to study, because they have the potential to expose and confirm the deepest, most visceral truths of our existence. Science should be embraced by the religious, and it’s very frustrating to see them bashing science. They align themselves with the same mentality of those who insisted the world was flat. Our global reality would be greatly improved by a new Renaissance or Islamic Golden Age that harnesses the best thinkers, undivided: theologians, scientists, anthropologists, everyone toward a goal of bettering the world of man, without heeding specialty boundaries and the counter-productive “thinking from silos” that’s so prevalent today. Unity. Unity would be great. I recommend checking out Dr. Schroeder’s take on the dinosaurs and the translation of tananim. Dr. Schroeder isn’t one of these “Answers in Genesis” types, he’s more a physicist who’s well-versed in Torah and takes you deeper. His explanations add richness to our understandings of the cosmos and Torah alike. It’s good to seek out scientific truths, (“…the things revealed belong to us and to our children forever” Deut. 29:29) and the exciting scientific discoveries ahead can only help us understand ourselves and all creation. « The Griffin Was Based On A Real Creature!